In August 1947, one of the largest mass migrations in human history took place. This was after India regained its independence from the British Empire. This might have been the end of the British Raj, but it was merely the beginning for India, Pakistan, and many of its surrounding regions. The subsequent chapter in history, known as the Indian Partition, sparked a large conflict and resulted in the death of many people. Even today, the struggle has not ended with the continuation of the Kashmir conflict. This was undoubtedly one defining moment in the world’s history, but how did the partition of the British colony take place? This article endeavors to shed more light on the creation of the separate nations of India and Pakistan. At approximately 25% of its population, Muslims were the largest religious minority in British India. The conflict between India’s Muslim population and its Hindu population were apparent long before the Partition. The notion of a two-nation state had been promoted throughout the second half of the 19thcentury. This theory claims that religion is the determining factor in defining the nationality of a group. Following that definition, Indian Muslims were entitled to be a sovereign nation where Islam could be practiced as the primary religion. 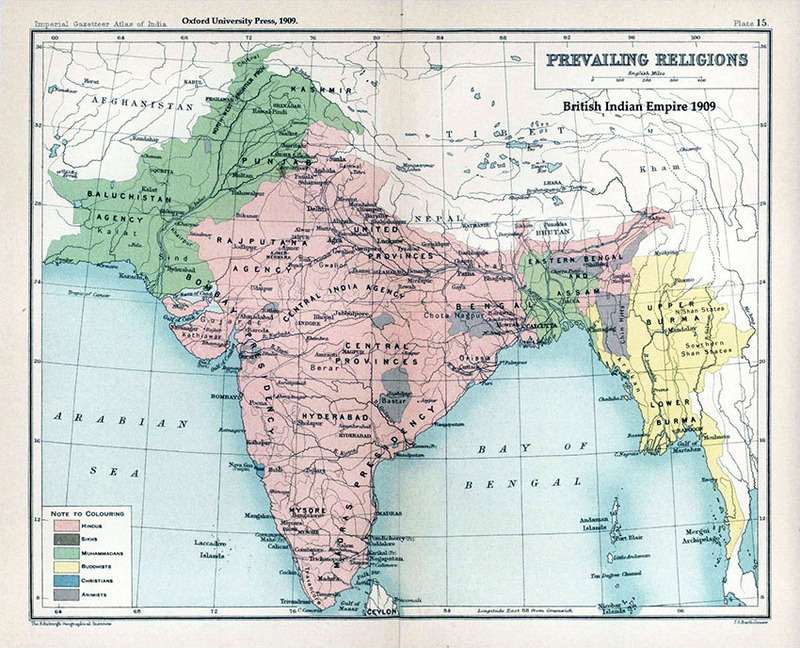 During the British rule, religious sovereignty was not the biggest issue. The British government insisted on speaking of Indians as “the people of India”, instead of speaking of an “Indian nation”. This was the justification for British rule, as “Indians were not a nation”. This type of governance allowed some autonomy among the Muslim minority. Under imperial rule, they enjoyed a protected minority status with a system of reserved legislative seats and separate electorates. This style of governing was often referred to as “divide and rule”. Yet, when it became apparent that the British rule might come to an end, the All-India Muslim League started a Muslim identity movement. In 1945-1946, the League won a majority of Muslim votes in provincial elections. Following this victory, the claims for an independent Pakistan became stronger. As the Second World War approached, the political stakes in India were significantly higher. In 1939, when the Second World War escalated, Britain brought India into the war without consultation. This was the beginning of the end for the British Raj. It sparked widescale national protests which culminated in the 1942 Quit India movement led by Mahatma Gandhi. In the meantime, the war called for more local allies. The Muslim League saw this as an opportunity to offer its aid in exchange for future political security. In March 1940, the Muslim League introduced the “Pakistan Resolution” calling for the creation of a “separate state”. Historians are still debating whether this demand was merely a bargaining chip or a firm objective. Either way, it might have intended to solve the Muslim minority issue, but it ended up aggravating the situation. Due to financial issues, Britain recognized that it could not sustain its empire. In June 1948, an Act of Parliament was issued as a deadline for the transfer of power. What this Act failed to address, however, was the issue of India’s Muslim minority. It proposed a loose federation, but this idea was rejected by both Congress and the Muslim League, which vowed to fight for an independent “Pakistan”. Meanwhile, civil killings continued. In August 1946, the Great Calcutta Killing took place which left some 4,000 people dead and an additional 100,000 homeless. Eventually, an ultimatum was presented which left politicians with little choice but to agree to the separation of the state. On August 14, 1947, Pakistan celebrated its independence. The new official borders split the provinces of the Punjab and Bengal in two. A partition of such a magnitude did not go by without backlash. Riots were started with mass casualties and a colossal wave of migration. Some 14 – 16 million people moved from one side of the border to the other. The direction in which they travelled depended on their religion. Hindus and Sikhs came together in a conscious effort to separate themselves from the Muslims. This chapter, unfortunately, did not go by without casualties. The death toll of the partition ranges anywhere between 200,000 to two million victims. Many were killed by members of their own communities and sometimes their own families. Especially, women were targeted as a symbol of community honor. Reportedly, up to 100,000 women were abducted or raped. One of the reasons why the partition sparked such extreme emotions was because many people were not only very deeply attached to religious identity, but also to territory. Furthermore, British troops were reluctant to maintain law and order. Another unforeseen side-effect was the ultimate homogeneity of Pakistan. The Muslim League had anticipated that Pakistan would contain a substantial non-Muslim population, whose presence would safeguard the Muslim population remaining in India. Instead, in West Pakistan, non-Muslim minorities comprise only 1.6% of the population. Pakistan was evidently created as a “safe land” for India’s Muslims, but not all Muslims supported its formation. Thus, many decided to remain in India and still form the largest minority group in independent India. This led to ongoing conflicts. The nationally beloved icon, Mahatma Gandhi, was assassinated in January 1948 by a Hindu nationalist extremist who blamed him for being too supportive of the Partition. After the Partition, both states faced substantial problems accommodating and rehabilitating post-Partition refugees. When the two nations went to war over the disputed territory of Jammu and Kashmir, the number of refugees skyrocketed. Unfortunately, the relationship between the two nations has hardly improved since the 1950s. Kashmir still remains a territory of conflict. Since the Partition of India, the two nations have fought three wars over the region: the Indo-Pakistani Wars of 1947 and 1965, and the Kargil War in 1999. To make matters even worse, both nations are now nuclear-armed and terrorist attacks are frequent. In February 2019, one of the deadliest attacks took place. A Kashmir separatist terrorist group, Jaish-e-Mohammed, carried out a suicide attack on a military convoy killing over 40 Indian soldiers.